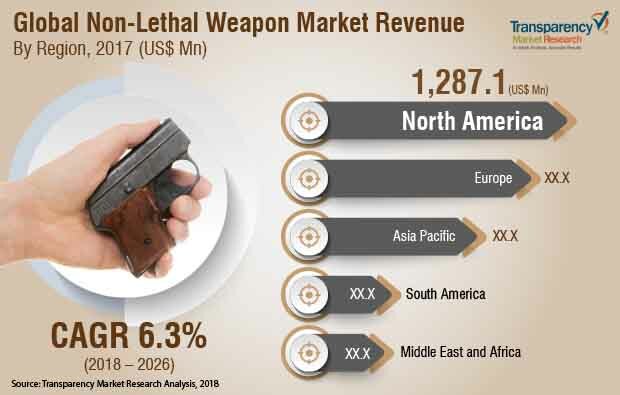 According to a new market report on non-lethal weapons, published by Transparency Market Research, the global non-lethal weapons market is expected to reach US$ 6,591.8 Mn by 2026, expanding at a CAGR of 6.3% from 2018 to 2026. According to the report, the global market will continue to be influenced by a range of macroeconomic and industry-specific factors. Asia Pacific will continue to be at the forefront of global demand, with the market in the region growing at a CAGR of 7.2% through 2026. Stringent government regulations and measures are being adopted to provide better security measures to civilians worldwide. In addition, globally, non-lethal weapons manufacturers are constantly developing and launching innovative products, compliant with international and regional laws, in order to provide citizens with self-defense alternatives. The use of lethal force against assailants is discouraged by law, which in turn is opening up new opportunities for use of less lethal weapons. The global non-lethal weapons market is broadly segmented by product, technology, application, and region. By product, the market can be segmented into direct energy weapons, conducted energy weapons, gases and sprays, water weapons, and others. The direct energy weapons segment is anticipated to be the highest revenue contributing segment in 2018 with 25.4% of total market revenue and is expected to rise at a significant CAGR of 5.9% over the forecast period. This is mainly due to technological advancements in this sector. In terms of technology, the market has been divided into mechanical and kinetic non-lethal weapons, chemical non-lethal weapons, acoustic non-lethal, electromagnetic non-lethal weapons, and other technologies. Acoustic non-lethal weapons segment is expected to grow tremendously at a CAGR of 8.1% due to inclination toward crowd repellent weapons. Based on application, the global non-lethal weapons market has been segmented into military,law enforcement agencies, and civilian. The market share of military is estimated to increase at a healthy CAGR of 6.6%, reaching market value of US$ 3,242.3 Mn by 2026. Presence of numerous market players and significant number of small and medium sized industries in the global market is a primary factor for the adoption of non-lethal weapons. In 2017, North America accounted for the largest market share as the U.S. is observed to be the largest developer, operator, and exporter of non-lethal weapons. However, Asia Pacific is predicted to be the fastest growing region by reaching US$ 1,582.5 Mn at a CAGR of 7.2% during the forecast period. This is mainly due to focus on development of non-lethal weapons for military and law enforcement applications in order to control attacks and riots in India, China, and other APAC countries. The research study includes profiles of leading companies operating in the global non-lethal weapons market. Market players have been profiled in terms of attributes such as company overview, financial overview, business strategies, and recent developments. Some of the prominent players in the non-lethal weapons market include BAE Systems Plc., Combined Systems, Inc., General Dynamics Corporation, Lamperd Less Lethal, Inc., LRAD Corporation., PepperBall Technologies, Inc., Safariland, LLC, Stringer Solutions, TASER International, Inc., The Boeing Company, The Raytheon Company, and Yellow Jacket Case. Companies are focusing on expanding their business through strategic acquisitions and partnerships with several end-use industries.